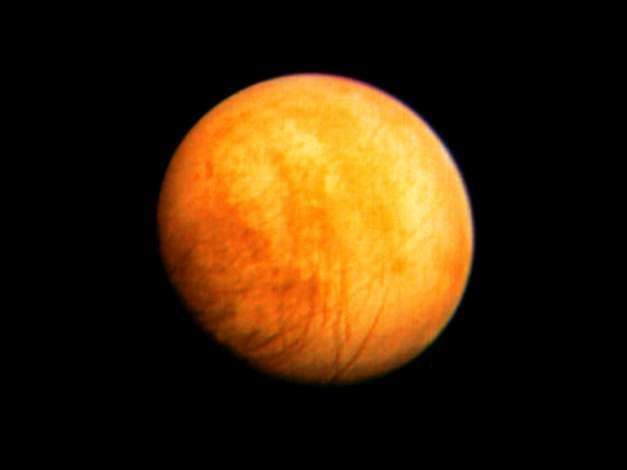 Information: View of Europa taken from a range of 2,869,252 kilometers (1.6 million miles) on March 2 at 2:00 p.m. The color composite is made from three black and white images taken through the orange, green and violet filters. The 170-degree longitude is at the center of the picture; this is the face away from Jupiter. Irregular dark and bright patches on the surface are different from the patterns on the other satellites of Jupiter and those on the Moon, Mars and Mercury. Dark intersecting lines may be faults that break the crust.